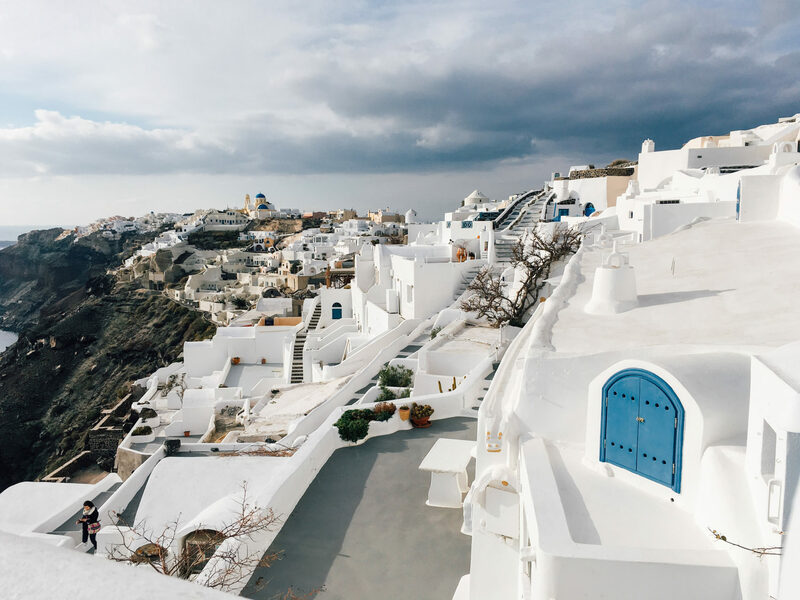 This island is probably the image we all have of Greece, a huge cliff full of houses painted white and blue. Located 200 km from Athens, this small archipelago of 5 islands is one of the main tourist attractions of Greece. The enormous cliffs of the islands were formed by its active volcano, whose crater can be visited on a tour. This pearl of the Mediterranean is the ideal destination for those who want to have a romantic holiday, it is one of the most chosen destinations for honeymooners. 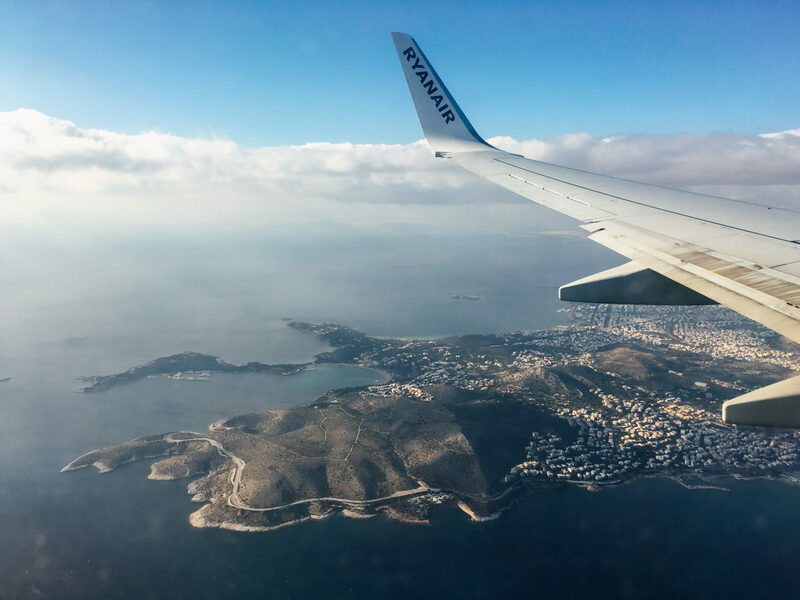 The best way to reach to Santorini is by plane from Athens. The flight lasts 40 minutes. Another option is by ferry from Piraeus port and it will lasts between 5 and 8 hours but the ferry can be cheaper if you buy ticket in advance. 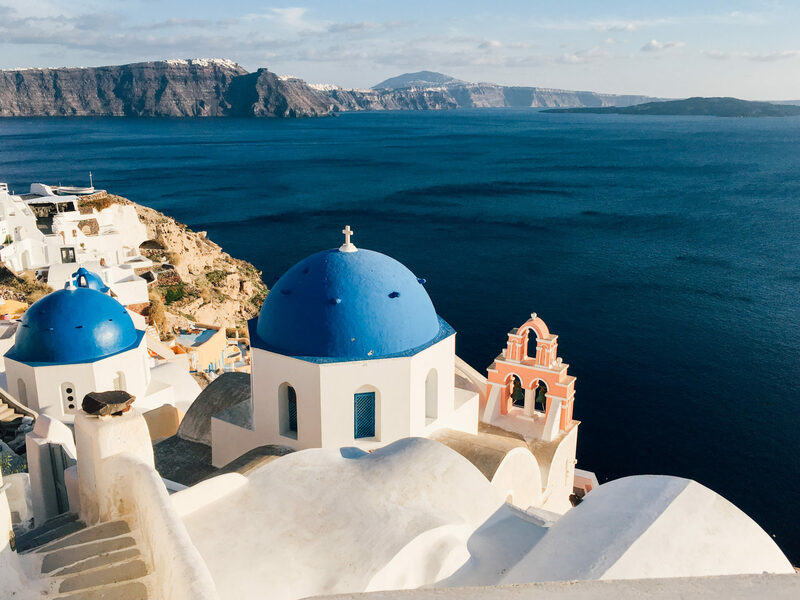 In the summer there are up to 20 daily flights to Santorini. Prices are between 15-200 Euro for a flight of 40 minutes. Planes taking off from Athens International Airport which is 40 minutes from downtown. The first flight departs from Athens at 5:15 am and the last one at 23:15 pm. So you can choose any time of the day for your trip. The cheapest flight is with Ryan Air. In the summer time there are also direct flights from all over Europe, in winter you will be able to get in Santorini only via Athens. In the winter there are over 4 ferries leaving from Athens to Santorini. Prices are between EUR 20 – 76 and the journey takes about 5 to 8 hours. 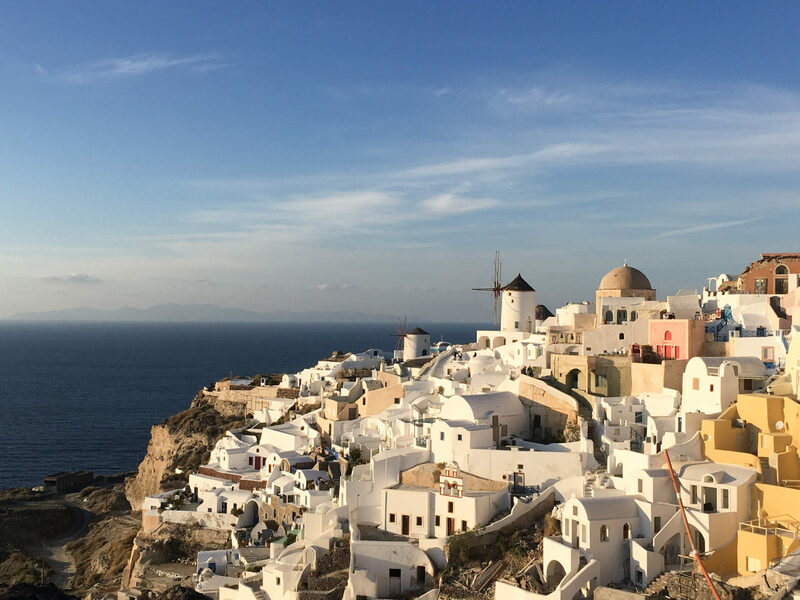 The cheapest ferry to Santorini is Blue Star. It’s comfortable, you will get a chance to walk on the deck enjoying the landscape and the sea, but the journey takes about 8 hours. 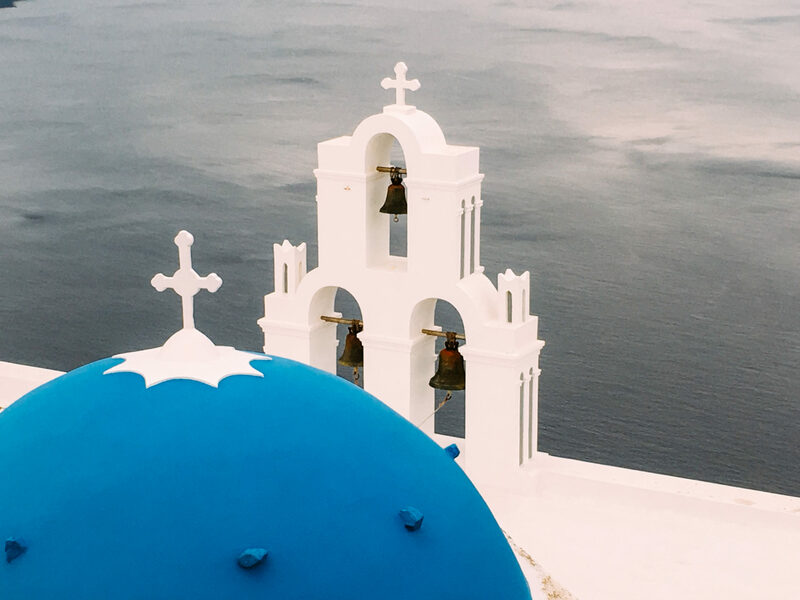 Every morning a ship leaves from Athens at 7:25 am and stops in Paros and Naxos after that it arrives in Santorini at 2:55 pm. 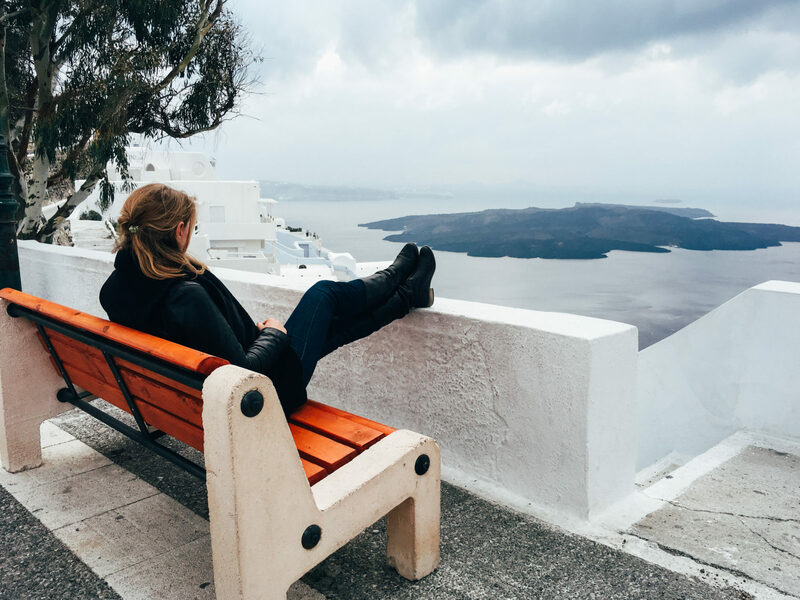 From June to September there are three extra ferries at week nights that leaves Athens at 5:30 pm (Tuesday, Friday and Sunday) and will arrive in Santorini at 2:00 am. The fastest journey takes from 4 to 5 hours with Hellenic Seaways High-speed but it won’t be that comfortable. It can shake you a little bite if the sea is rough and you won’t get the chance to get on deck. From June to September there are also overnight ferry leaving Piraeus at 11:30 pm and arriving Santorini at 8:00 am. 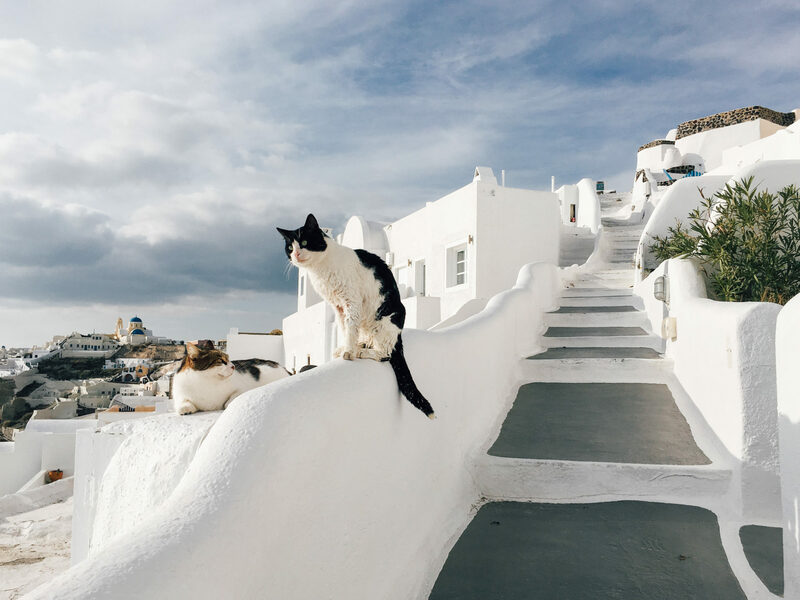 Another option are the catamarans of SeaJet which are running from March to October from 7:00 am, departing from Piraeus go through Mykonos, Naxos and reach Santorini at 11:20 am. For the summer time, from May to September there is a ferry that departs from Athens at 3:45 pm and arrives in Santorini at 9:25 pm. But it’s a small catamaran and if the sea is rough, it wont leave the port or if it leaves on such weather you will have an unpleasant experience. These type of ships are recommended for short distances between islands. Ferries leave from the port of Piraeus which is reached form Athens by train, in 20 minutes. The distance between the airport and Fira (island’s capital) is 7 km and the cost of a trip is around 20 Euro. Make sure you have cash. Taxis in Santorini do not accept credit cards. Although distances in the island are small, because of the rough rounds and congestion, it can take some time to reach your destination. Check if the hotel offer transfer services. The cheapest option to reach Fira from the airport is by bus. If you go in any other city of the island will have to go to Fira and from there to take another bus to your destination. Bus schedule changes according to the planes landing and the season. So you’d better check the website Santorini buses, before. Ticket can be bought directly from the driver and it costs 1,80 Euro. 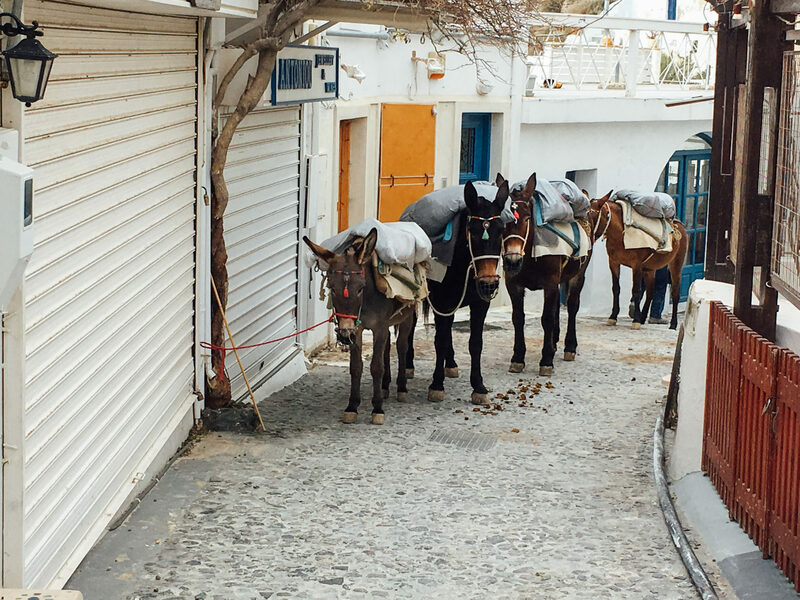 Another way to get to Fira from the port is on the back of a donkey who will climb the 586 steps. It is a traditional and quite controversial way. Not comfortable at all. Although it may be considered a method of mistreatment of animals, donkey are part of Greek culture and until the 70’s was the only known way to carry things. You can climb the 586 steps. It won’t be easy and I advise you to avoid it in very hot days. It is the island’s main port and most ferries arrive here. The distance between the port and Fira is 12 km and during the summer can be a busy road. The cost will be somewhere around 30 Euro. You have to decide how you will reach your destination form the port, before reaching the island. There will be hundreds of people disembarking in the same time with you and taxis are limited in Santorini. To avoid all the stress you could preorder online taxi that will wait for you in port. Of course, it will be slightly more expensive. The cheapest solution to reach Fira is by bus. The schedule dual according to the ships arriving. You can find more information on the website Santorini Buses. The ticket will be bought directly from the driver. Price is 2.30 Euro. The new port can be reach directly for other cities of the island. 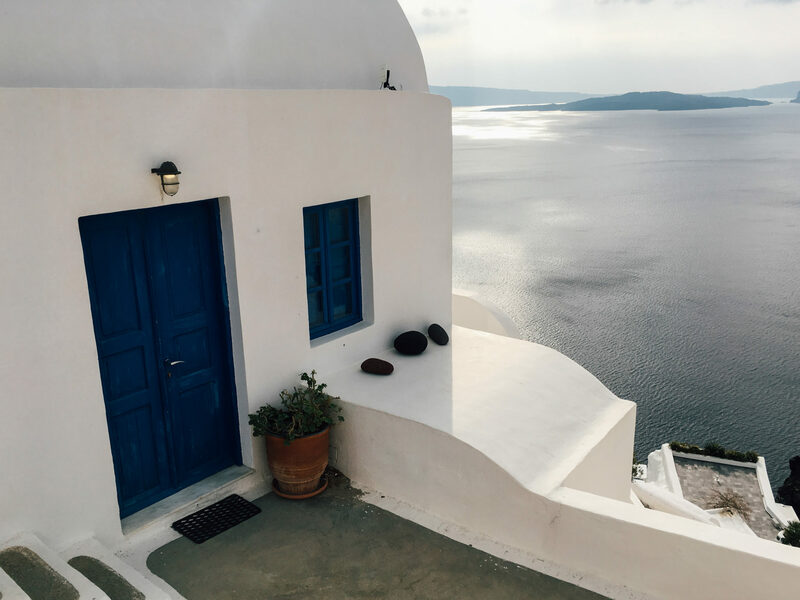 HOW TO MOVE IN SANTORINI? In Santorini transportation is provided by buses. The ticket price is between 1.60 Euro to 3.20 Euro. There are no tickets for 1 day or several days. Bus stations are nothing like those in Europe, so you have to be a little careful about signs. Sometimes buses leave earlier than the appointed time or don’t arrive at all, you should take into consideration this thing too. During the season buses will be crowded. Do not forget to check the bus schedule which you can find on the website Buses Santorini. It schedule may change. There are many rental companies. To rent a car in Greece is very simple and less expensive than most of European countries. The price for a car is between 30 – 45 Euro, in high season. ATV or motorbike rental is very popular in Santorini. Being a small island, you can get easy almost anywhere. But I don’t recommend ATV or motorbike in winter. Not very pleasant. Prices are somewhere between 15 – 30 Euro. You must have valid international driving license. The prices are quite high. 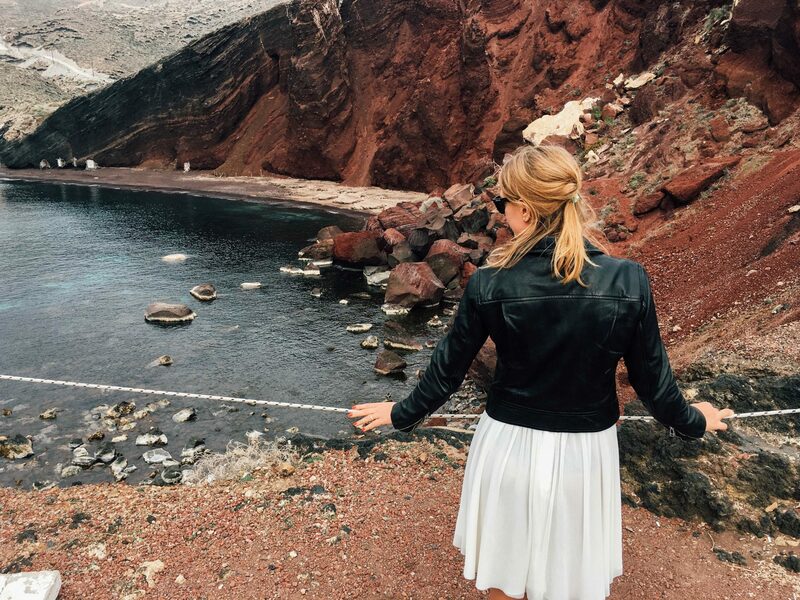 In the island there are several trekking trails and the most famous one is between Fira and Oia. Well, is not exactly a walk in the park, we’re talking about 10 km of ups and downs, but the view is breathtaking. The trail follows the caldera edge. Another famous trail is between Perissa-Kamari-Pyrgos. Between Perissa and Kamari is quite a short walk but from Kamari to Pyrgos the trail runs through the highest point of the island. The view is not to be missed. 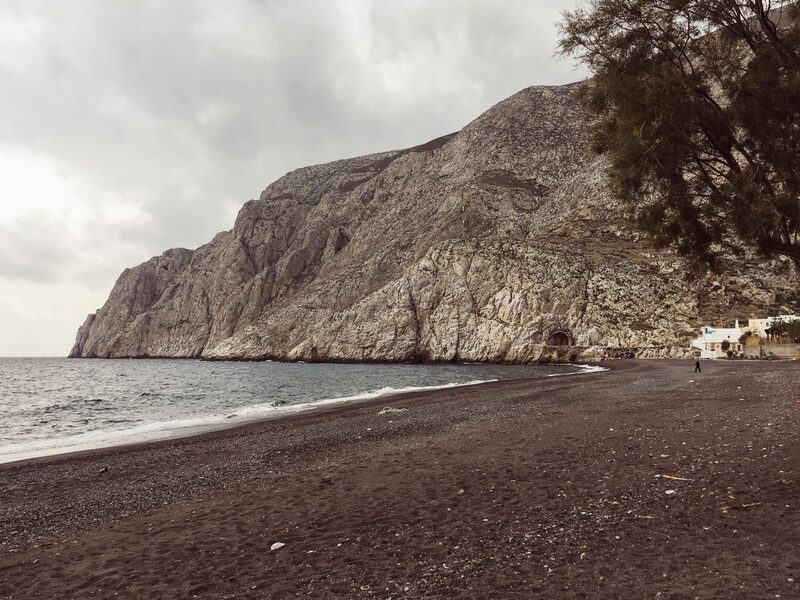 Although the island is small it can be divided into two distinct areas: the western part, which is called “​​Caldera” and the eastern part, with beach like Perissa and Kamari. Perissa and Kamari area is preferred by those who want beach bar, clubs, taverns and, most importantly, the beach! A little black because of the volcanic soil, pebbles, but organized with sunbeds and umbrellas. 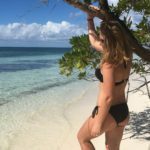 The best beaches are stretch on the eastern side, beaches like: Perissa, Kamari, Perivolos, Red Beach, Kolumbo Beach, Agios Georgios and the list goes on. 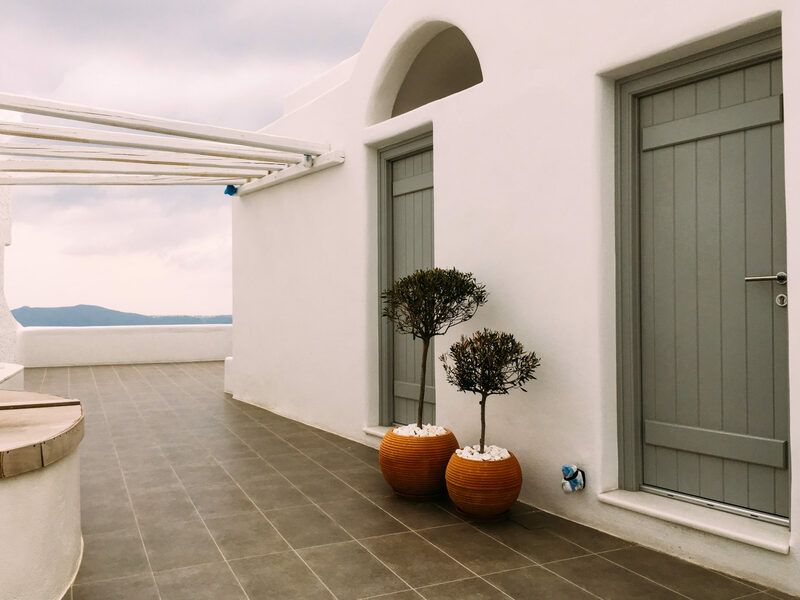 In these areas tourists can find all types of accommodation, from studios and apartments up to 4* and 5 * hotels, depending on your budget and preferences. The western part is called “Caldera” and it is the volcanic cone where the mountains take a fall in the foamy waves of the sea and creates an unreal landscape. Hotels are built on successive layers of lava that can be found at 300-400 m altitude above sea level. Here you can find accommodation from studios to 4* and 5 * luxury hotels. The prices here are much higher that the eastern side of the island. 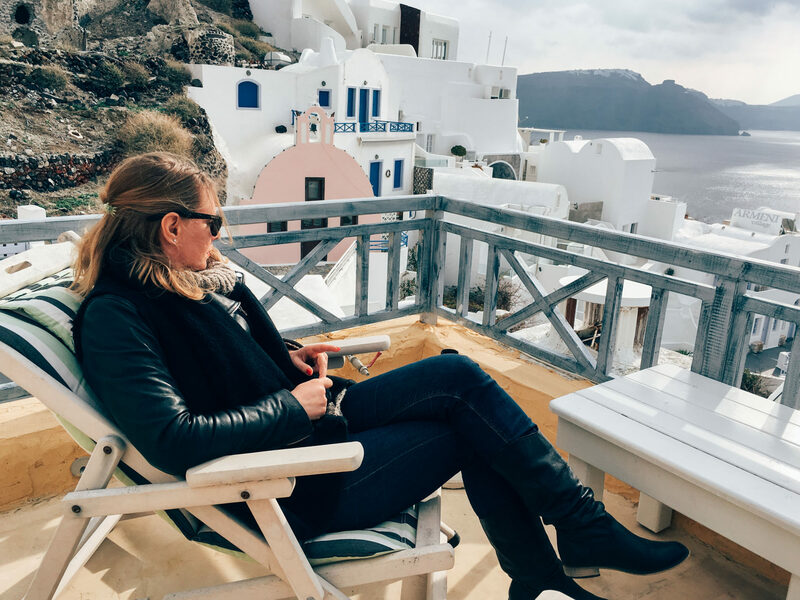 Well, the best way to stay in Santorini is in a small caves dug into the rock, called “troglodytes”, where you can find all the comfort of a perfect vacation. On the edge of the caldera with an “infinity pool” and an amazing view over the volcano. It will be little expensive but for sure an experience once in a life time. Fira is the capital city of the island and is a very beautiful and crowded place. 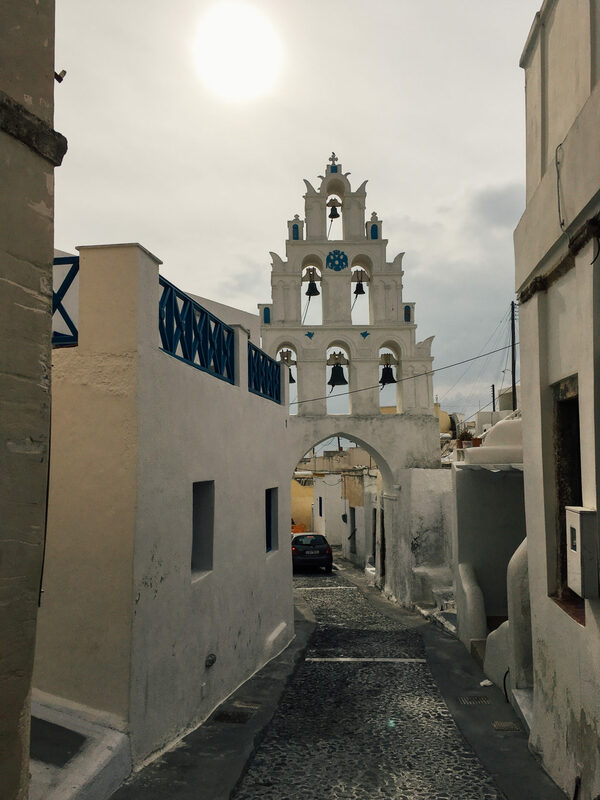 It is a typical Cycladic town with charming white houses and small paved walkways. Many of the houses were built after the Venetian invasion. His position offers an extraordinary view of the volcano. Imerovigli a tiny village where there are many hotels. It is very close to Fira. The name Imerovigli comes from the word Vigla, meaning place. In front of the village it is a rock called “Skaros”, home of a medieval city. 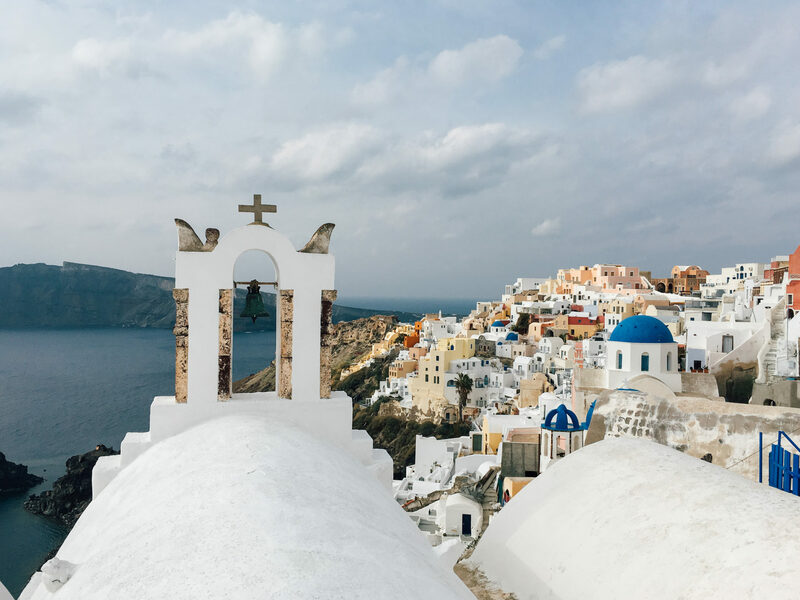 The small village of Oia is considered the perfect place where you can admire the most beautiful sunset in Santorini and the most beautiful village. Megalohori village, an architectural gem and a traditional place. The history of this city is way back in the 17th century with pirate hideouts and wineries. The importance of this town is given by Vinsanto wine that is still produce here. The village center is charming. Generally here the locals are meeting here to play cards or backgammon. Kamari is the home of the black beach. A blue flag beach that stretches down the Mesa Vouno Mountain. Along the beach there is a promenade dotted with taverns, cafes and places of relaxation. 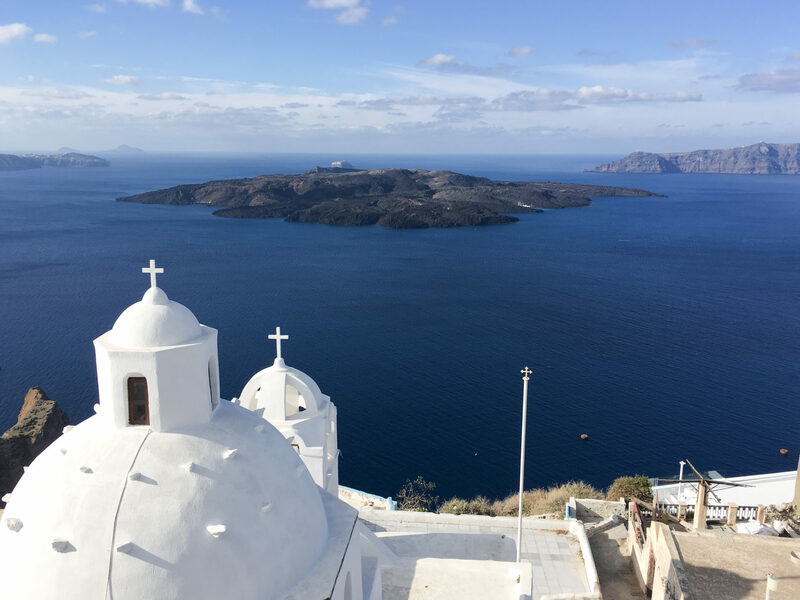 Close to Kamari village you can find Ancient Thira which represented one of the most important periods in the history of Santorini. Excavations began in 1896 and have unearthed settlements in the 6th century BC. Firostefani at 10 minutes walking distance from Fira. The village has many cafes, restaurant and hotel in fabulous spots. Perfect for sunsets. Perissa Village is part of the large and well-organized beaches and taverns on the beach like Perivolos and Perissa. At the pole of Mesa Vouno Mount, lies the ruins of the ancient Basilica Santa Irina. According to the latest evidence, the island’s name was given by this church. 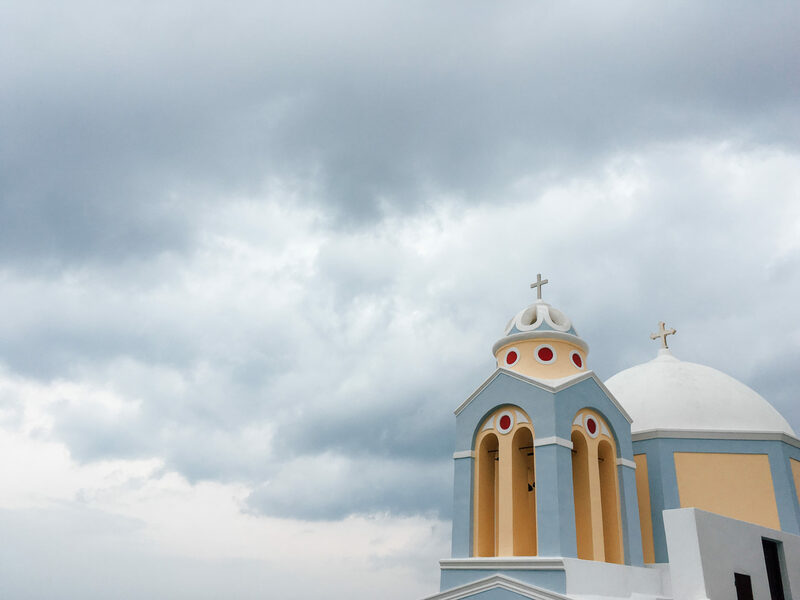 Monolithos took its name from the huge rock on which is built the church of Agios Ioannis. It is a quiet place, ideal for relaxing. Shallow waters and beaches make it perfect for families with children. Messaria is in the middle of the island, and was the industrial center. Akrotiri was one of the five fortifications of the island. It had a castle called “La Ponta” that was given to Gozzadini, an Italian family. Here is also the archaeological site of Akrotiri. The settlement dates back to the Neolithic times and grew to be one of the most important cities and port in the Aegean Sea. It was an important link in the commercial road between continental Greece and Egypt. The city was stretching on 20 hectares. The houses were majesties. Many of the found objects where brought from faraway lands. Everything indicates that the country was a blooming settlement with an advanced civilization. But everything has ended with the eruption of the volcano which swept everything in the island. 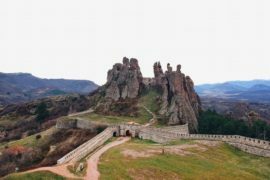 The list of the amazing villages can go on, but the rest I will leave for you to discover. 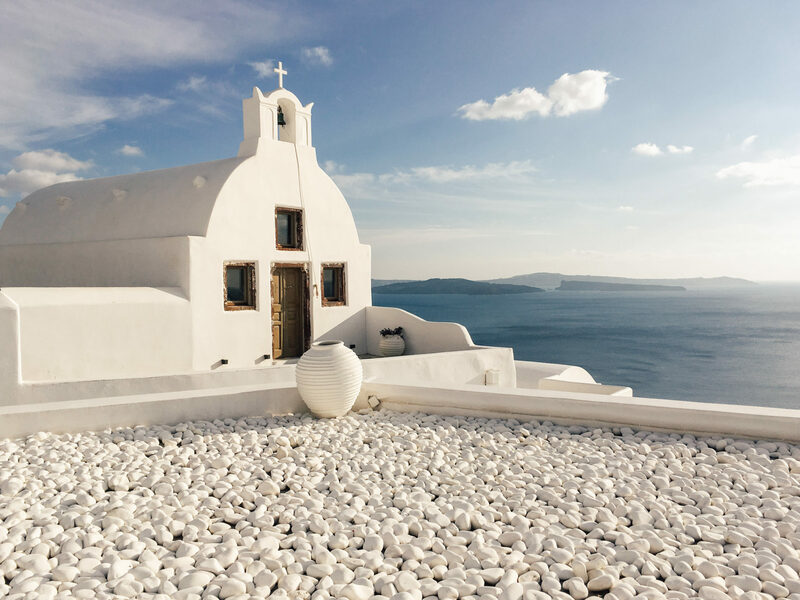 Santorini is one of the greatest natural wonders of the world, and its main attraction is the landscape itself. The current form of the island, approximately semicircular, is the result of an enormous volcanic explosion that sank the top of the island in the Aegean Sea, forming a crescent flooded called caldera. In the middle lies the volcano cone. 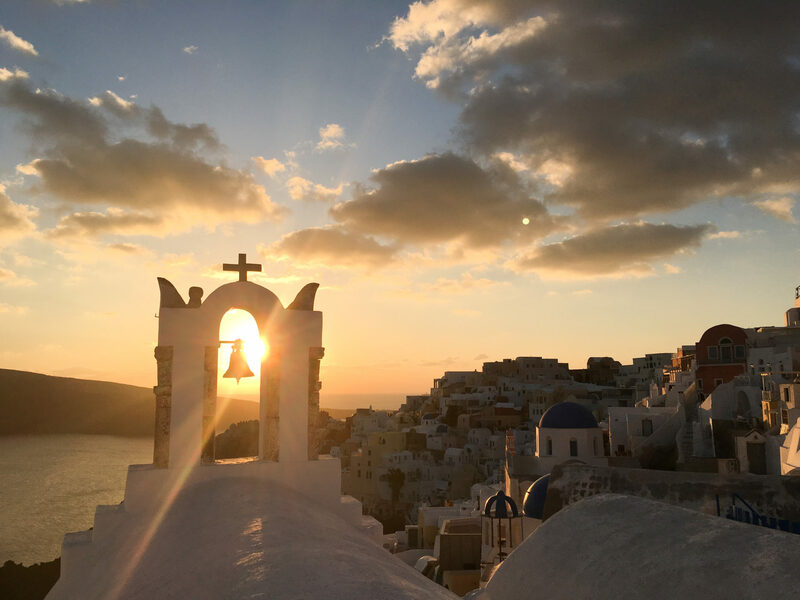 Another reason to come to Santorini is the legendary sunset, one of the most spectacular in the world. 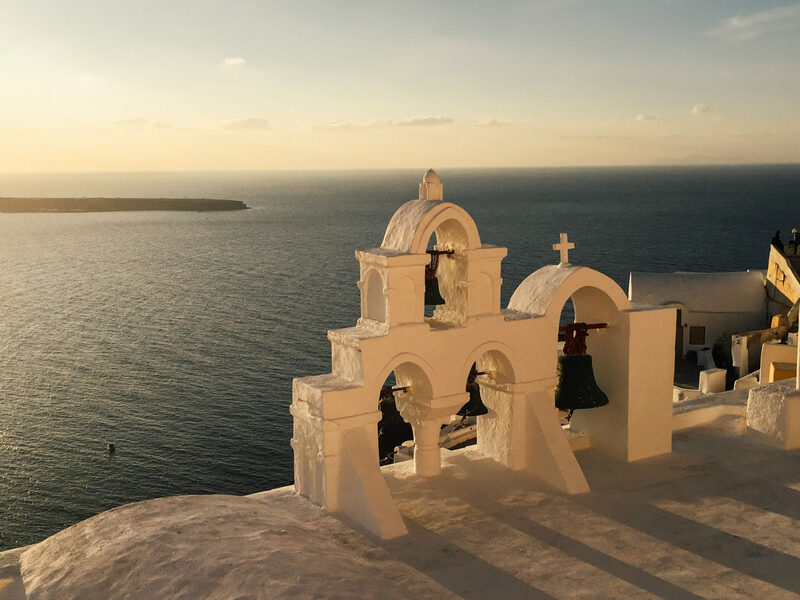 Oia is one of the best places on the island for a good view of the sunset over the sea. There are many offers for trips on yachts or catamaran in the caldera where you can spend a few hours. Let yourself carried away for a romantic evening along the coast of Santorini. 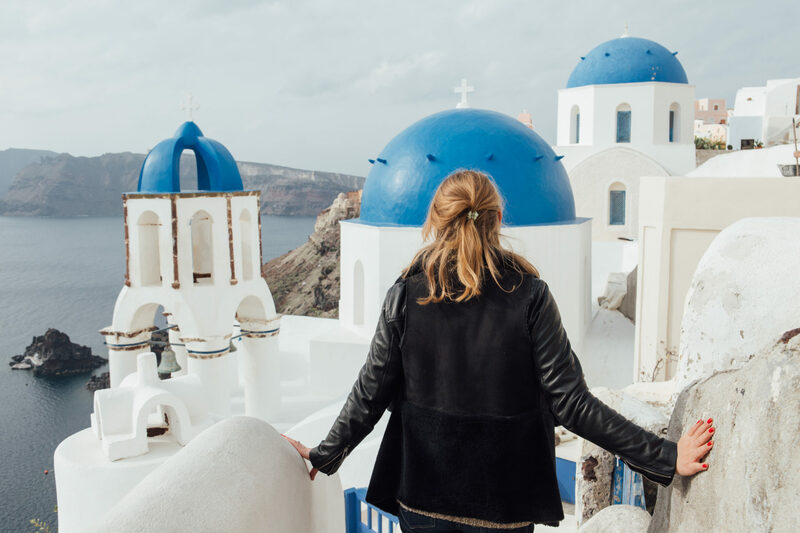 You will be able to enjoy the wonderful colors of volcanic rocks and the famous “Santorinian” sunset, all accompanied by good music, traditional Greek buffet and wine at discretion. A great way to start your evening. The price of these trips start with 40 Eur and go up, depending on the boat and offered luxury. 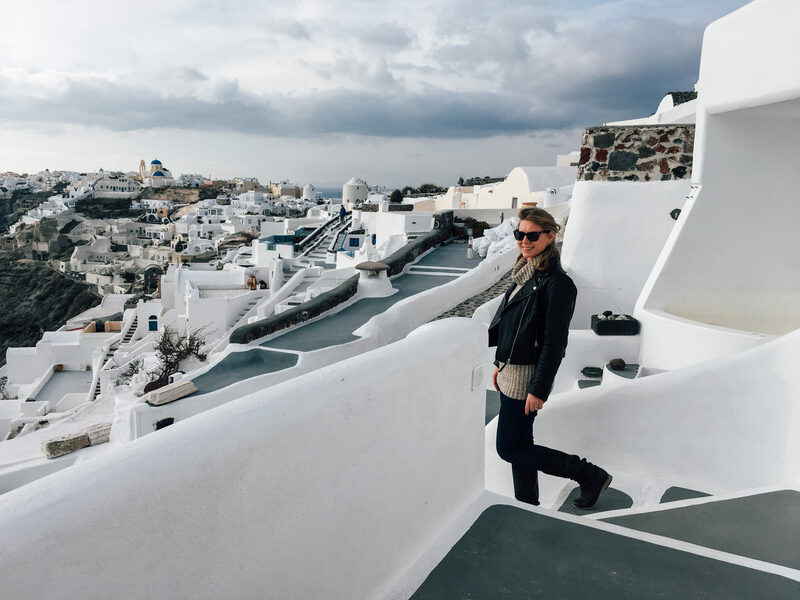 During this tour you will have the opportunity to visit the active volcano of Santorini, you’ll be able to walk on dried lav,a up in the top, you will feel the heat under your feet, and here and there you will see sulfurous gases steam. Next stop will be to the hot springs where you can swim in the natural Jacuzzi (35- 36 ° C). Be careful not to have light-colored swimsuit. The iron from the water can stain your suit. This trip can be done without the sunset in Oia. The price of such trips is somewhere between 32 – 40 Euro. 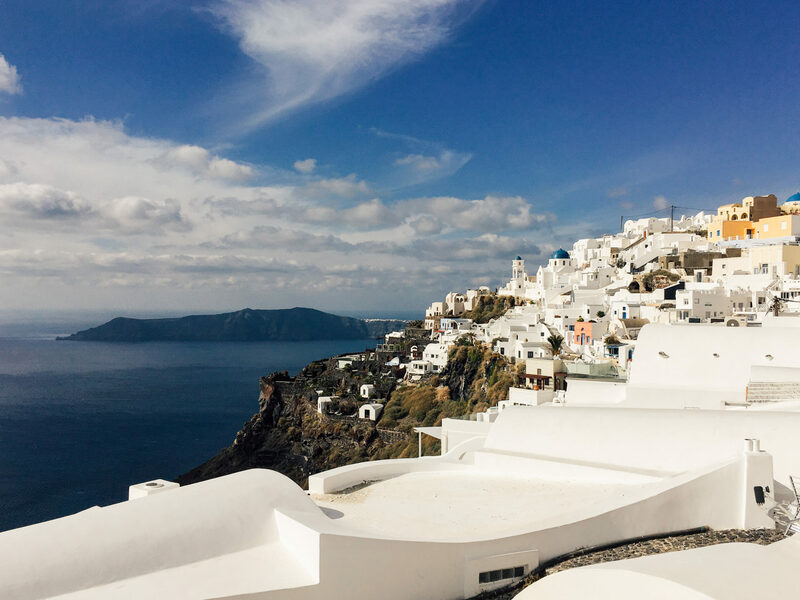 It is one of the most beautiful rides you can do in Santorini (a “must do in Santorini”). 10 km well marked road. You will pass through the amazing villages overlooking the volcano, you will cross the mountain, you will go up and down. The trail isn’t a walk in the park but it will take you in a world of wonders. You should make it in about 3-4 hours. Akrotiri is a 3500 years old Minoan town preserved in volcanic ash like Pompeii, is one of Santorini’s “must-sees”. Excavation site can be visited any time of year. The ruins are extremely well preserved. Streets, buildings, stairs and even second floors of buildings are still visible. 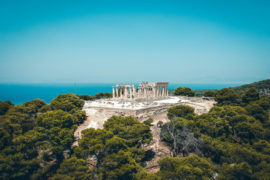 Visitors can stand in ruins and look at Minoan pottery and frescoes, with a little imagination, feel what it was like to live in ancient Greece. There are many wineries in the island. Go to one of them and to do a tasting. The wine here has quite different tasted. Part of the charm of this island is the relaxed atmosphere. 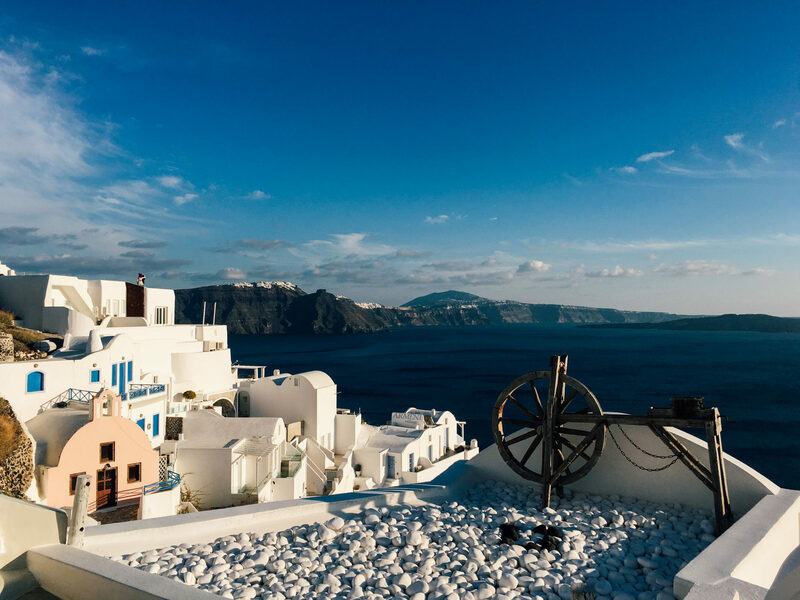 If you want a party for sure you will find one, but Santorini is recommended to get rid of your watch, to sit in a hammock and enjoy the peaceful atmosphere around. Although is not a famous place for beach and bathing, there are some pretty interesting and varied beaches. You can choose the Black beach that heats up well, in summer. For the Red Beach you must do a little hiking up the mountain to get here. Has earned its name from its red rock full with iron, which rises above the beach. White Beach is reachable only by sea form the Red Beach or Akrotiri. Once there you have to go to the beach through the water, because there is no pier. Vlychada is a beach frequented by nudists. Amoudi is not a beach but a swimming area, isolated, accessible from Oia. Here there is a platform on a large rock, where you can make jumps. Perivolos is a very pleasant sandy beach. Here there are many bars and restaurant, it can be seen as a “day club”. Monolithos is quiet but well organized with all the comforts, such as clubs and restaurants. Baxedes is the main beach in the north of the island. Baxedes is a peaceful place with black sands. Pori is a stunning beach on the east side of Santorini, where rocks have a unique red. Mesa Pigadia is a beautiful rocky beach near the city of Akrotiri. 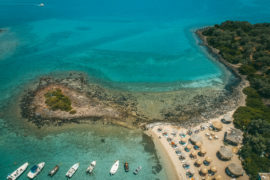 Agios Georgios is a beach that has everything from water sports to the beach bars. There are a few small taverns here and is the perfect place to have a quiet bath. 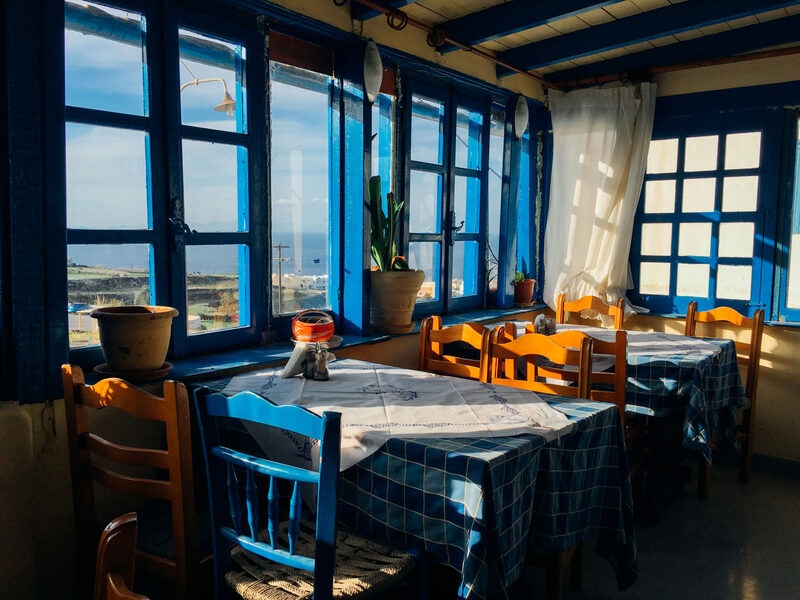 Santorini, although small, is considered a gastronomic destination, with some of the best restaurants and wineries in the country. 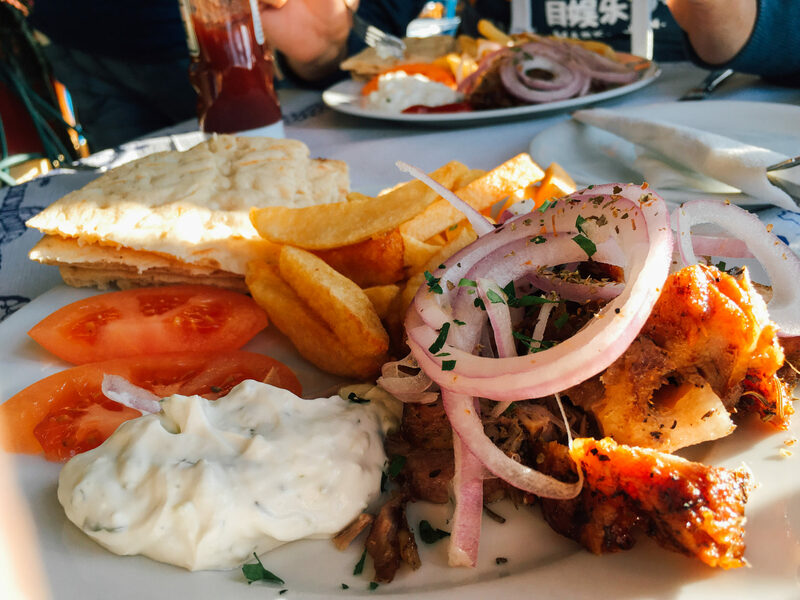 Santorini cuisine is mainly based on agricultural products of the island. Volcanic soil, sunlight and sea breeze of the Aegean Sea gives to the products an unique taste, top quality ingredients to cook original, tasty and healthy. 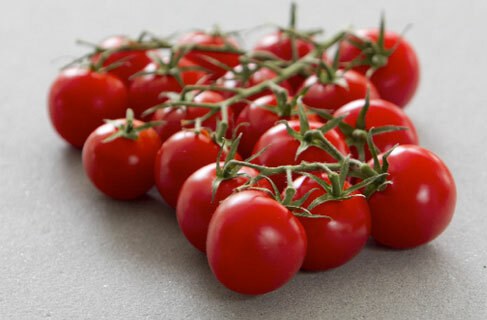 The famous Santorini tomatoes is a unique variety that flourishes because of arid ground and due to lack of water it becomes very sweet. These tomatoes are use like tomato paste, sun dried or in different traditional meals like fried meatballs, tomato keftedes. However their taste is truly unique. White eggplant. On Santorini can be found a special type of eggplant. The locals are preparing a very tasty salad with it. 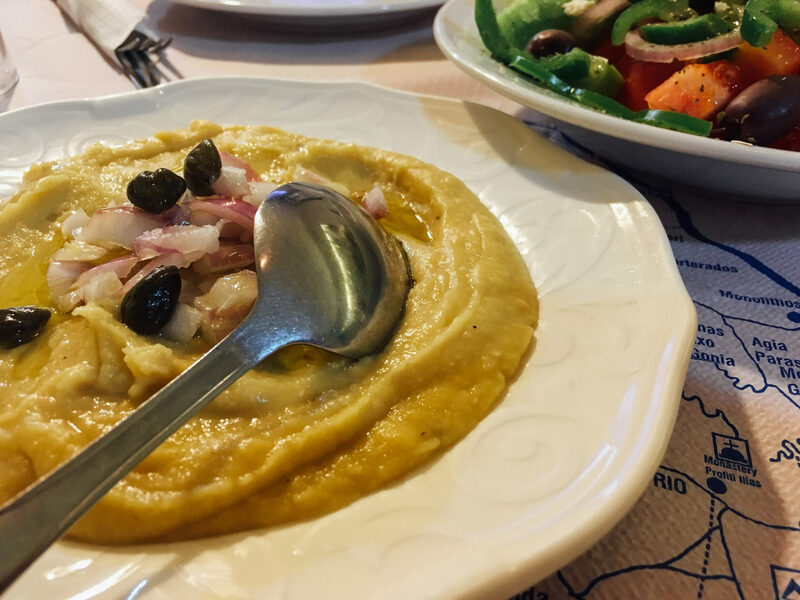 Fava is a kind of cream (mashed) of yellow peas, served as appetizer (meze). Capers are another symbol of the island and it is added to salads or sauces. The leaves are consumed as well. Marinated are a delicacy. I have eaten capers before, but no leaves! Well, now I had the chance, and I can say that I loved it. It also give a special flavor to salads. 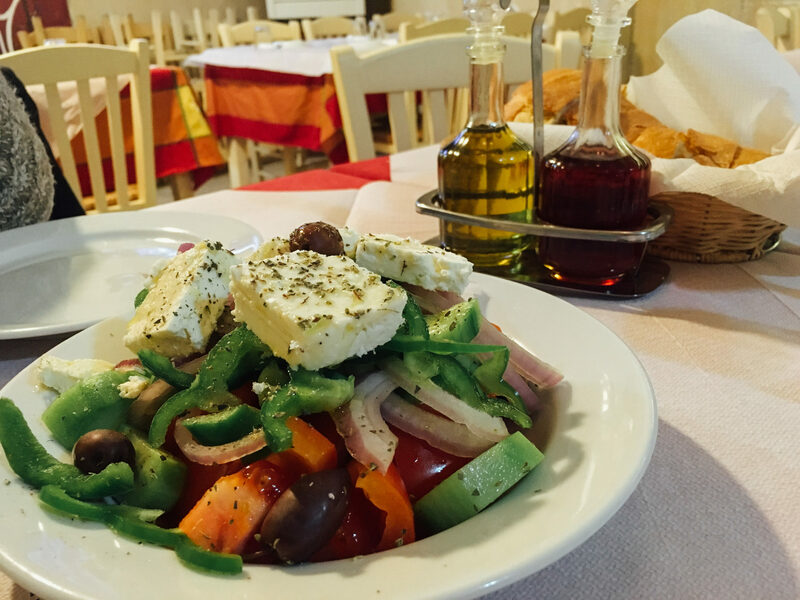 Greek salad is very famous everywhere in Greece. Each time was great. 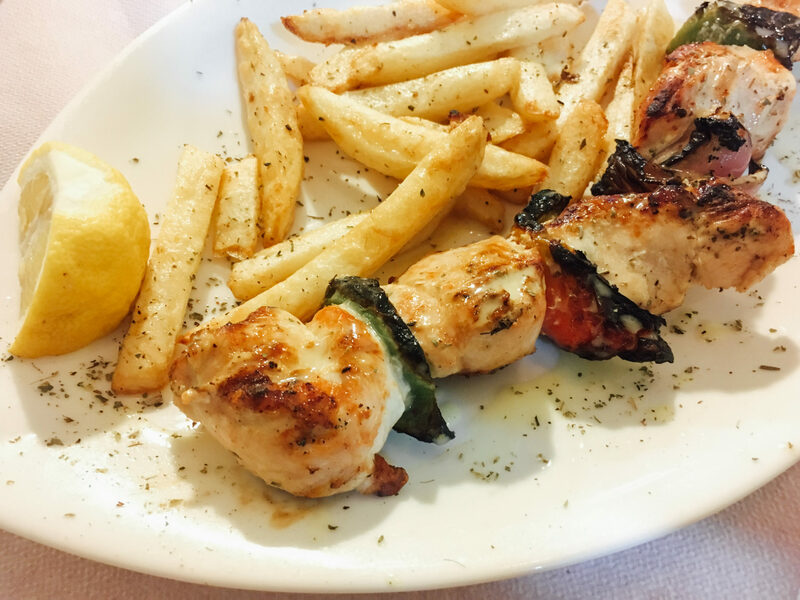 One of my favorite’s things while visiting Greece or Italy is to eat fresh fish and seafood. Mixes plate seemed very suitable, because you can taste a little of everything. Best grilled calamari and the best fish I have eaten in Greece. Vinsanto is the traditional wine of Santorini. It is a sweet wine, a red-brown, highly fragrant and a bit like brandy to taste. Probably experts in wine would not qualify under Category “wine” but to me it tasted delicious. It is served before eating or as a dessert. The sweetness of this wine is natural. The grapes are harvested late, leaved to dry in the sun for 10-14 days and then are processed giving to the wine an unique flavor. 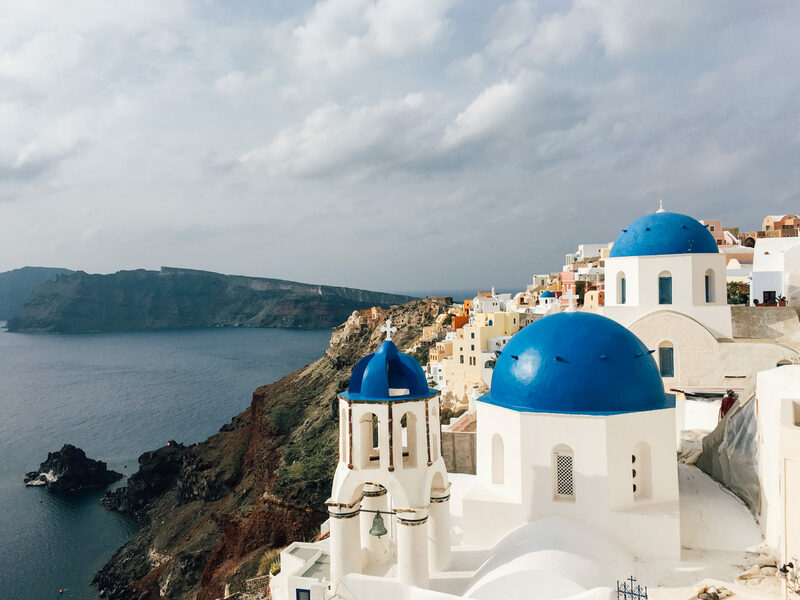 Santorini is an island that cannot be tasted on the run. You will have to walk, to give it time in order to capture the true beauty of this place. So rather than pay for a 1 day tour, organize it yourself and give yourself some time to understand it. Rent a scooter, an ATV or a car and try to explore the island on your own. For many people this is one of the most enjoyable things on the island. 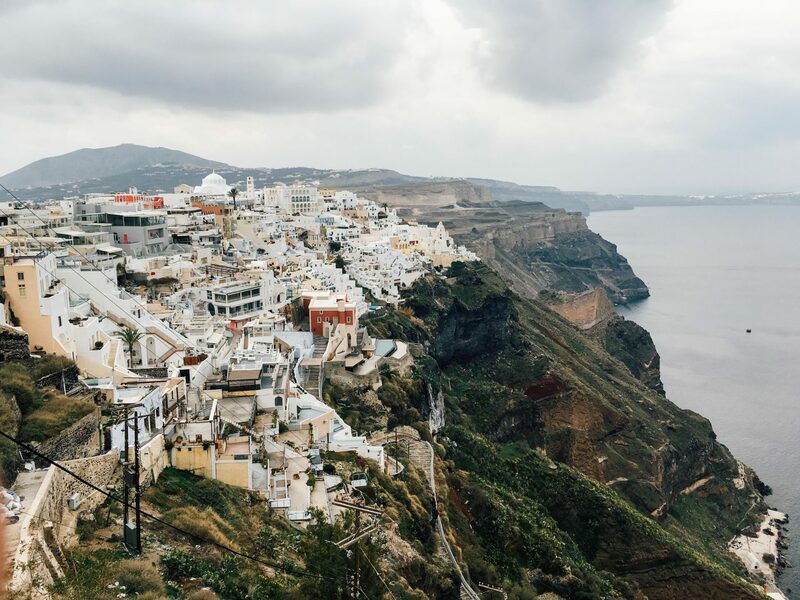 Santorini can’t be seen entirely in one day. Just go and explore! 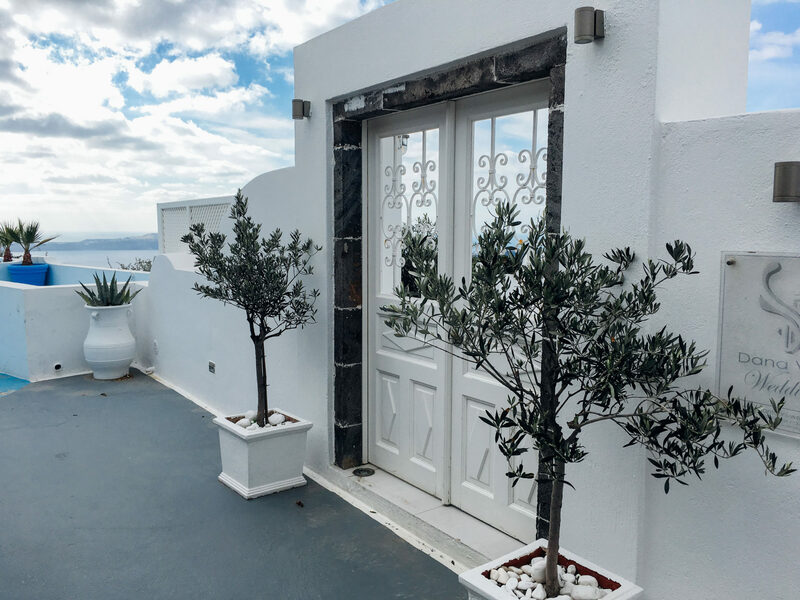 Or simply forget the notion of time and relax in a balcony overlooking the caldera in a peaceful atmosphere. Hi Roxana, thank you for an informative blog post. 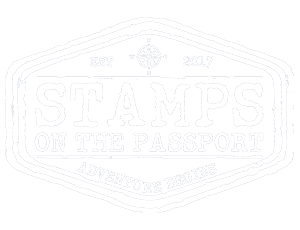 My husband and I are heading to Athens and Santorini in at the end of March 2018. 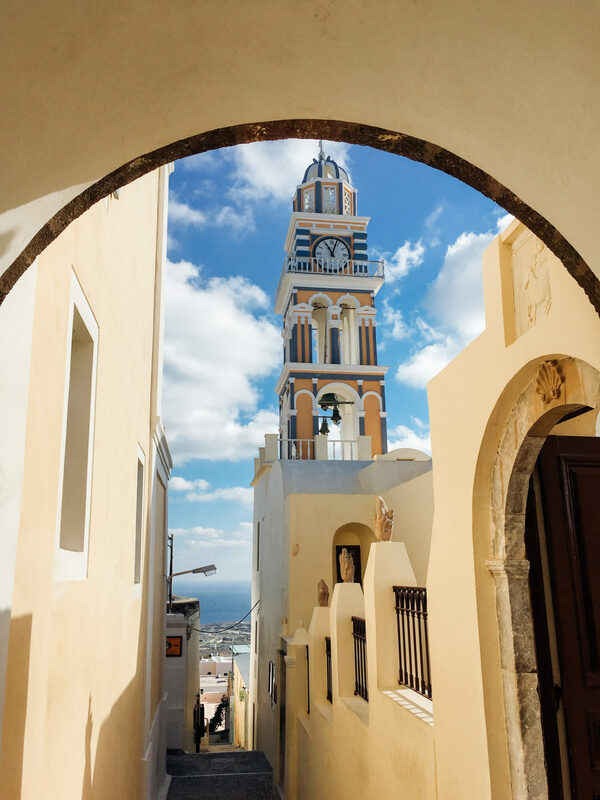 What time of the year were you in Santorini? I m so happy that you find the guide helpful. 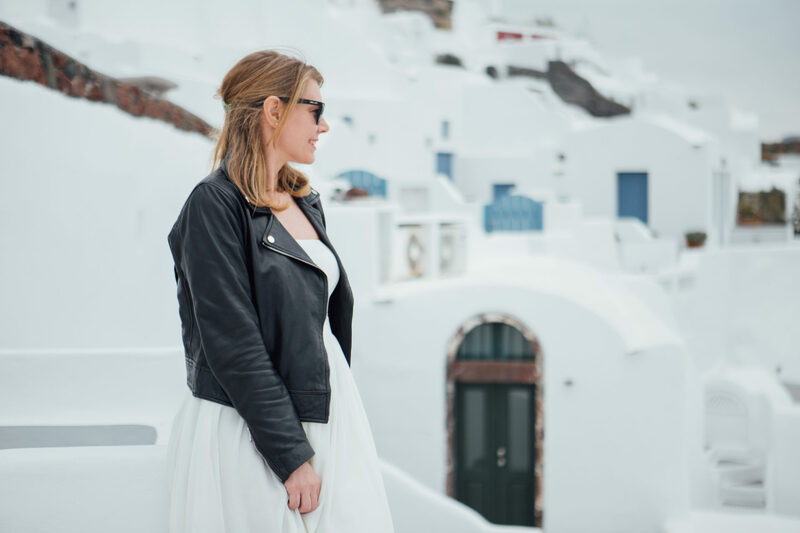 We visited Santorini and Athens in winter time, to be more exact in late January. 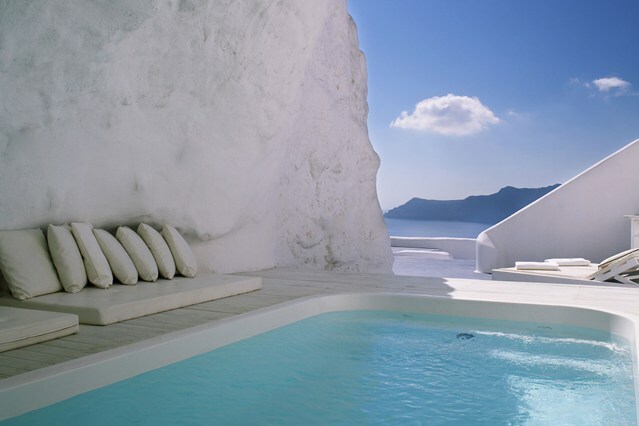 You won’t be able to swim or maybe to have a sunbath but most definitely you will have all Santorini for yourself. There aren’t so many tourists that time of year. The temperature during the day was somewhere between 13-16 degrees.